Vernacular Name : Van Haldi, Kapurkachali, (Hindi); Ginger lily (English); Shathi, (Sanskrit). Description : It is an annual herb, with a horizontal root-stock, and tuberous root fibres, leaves are 30 cm or more in length; inflorescence spiked; flowers ascending and dense yellow coloured; capsule is globose. Distribution : Native to China, India, Myanmar, Thailand and Ethiopia. 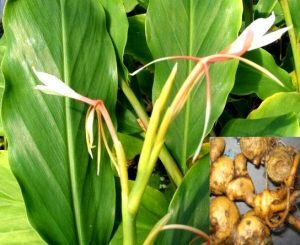 Phytochemistry : Rhizome contains an essential oil (ethyl ester of p-methoxy cinnamic acid, d-sabirene cineole, sesquiterpenes and pentadecan methyl paracumarine acetate), beta-sitosterol and its beta-D-glycoside starch, resins, organic acids, albumin and saccharine. Uses : Rhizomes are used in Nausea, vomiting, bronchial asthma, halitosis, diminished appetite, hiccups, local inflammation; rootstalk is useful in local inflammatory, nausea, asthma, bronchitis, hiccups, and in pain.